Made by the U. S. Legend Car International, Inc., the Bandolero, is sanctioned by the INEX governing board. The mission statement of the USLCI is “to provide a fun and affordable racing opportunity in which anyone can compete. This series is an attempt to fight the high costs involved in racing, and the rules are strictly enforced to ensure fair competition and cost control.” The cars are produced in North Caroline but have dealerships all over the U.S. and various other countries. After racing in the Quarter Midgets my next move up in racing was into the INEX Bandoleros. You can be as young as 8 to race these fun cars. 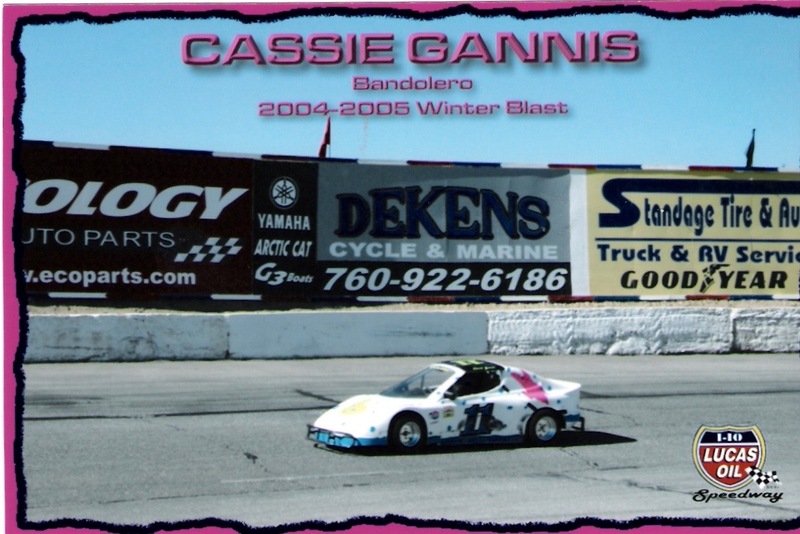 I was 12 was when I got my first Bandolero racing car from a dealership in Las Vegas. My entire family helped with the car. My first race was at The Bullring at Las Vegas Motor Speedway. In 2002 there were no bandos racing in Arizona. It was getting hard to always go to Las Vegas to race. So my dad and I brought the series to Tucson, Arizona. It was an instant hit! The fans of Tucson Speedway loved watching these cars race. We always had a field of at least 10 cars. Young and old were interested in these cool little racecars! I loved my Bandolero! My favorite cartoon at the time was Sponge Bob Square Pants so my car was painted just like the cartoon! I raced that car from 2003-2003. I raced in Tucson, Last Vegas and Blyth. In 2003 I was the Arizona State Champion. I am most proud that we brought the car racing series to Arizona. It is great to see all the drivers and Bandoleros still racing in Tucson. I enjoy knowing that I was a part of bringing the racing series to the track. Let me know if you are racing in the Bandolero Series or have seen them race. Let me know your thoughts and what you think of the series. Racers, I would love to see a photo of your Bandolero car. ⟵Is there a natural nutritious treat that I can give my pet? Glad to hear from you. Hope you enjoy reading more blogs soon.